Which photography website builder are photographers most satisfied using? I asked 1,630 photographers to find out. Format is almost universally loved for it's fair pricing, themes that showcase photography and ease of use. It's an excellent tool for photographers— many users mentioned they loved the Lightroom integration— but will work for anyone needing a portfolio. Though there are some minor quirks here and there but users were often willing to overlook them because support was speedy and the PortfolioBox team always seems to be improving the product. When you search Google for "best photography website builder" you find a lot of fluff and nonsense. Format is the highest rated photography website builder. So when I sat down to find the best photography website builder I knew I wanted to do it right. I talked to 1,630 real-life, verified users of photography website builders and asked them one simple question: do you recommend the photography website builder that you’re currently using? I used their responses to calculate a customer satisfaction rating for the top 16 photography website builders. My work is supported by affiliate commissions when readers choose a photography website builder based on this guide. Foliolink is one of the oldest photography website builders— many users we talked had been with them for 8-10 years! Users suggested that customer support is strong but that Foliolink is a bit on the expensive side. Cargo Collective is simple and easy to use. The big question around is the new Cargo 2— users seemed to like it but ran into trouble when adding code (though wading into HTML and CSS is no longer required in Cargo 2). Simple but limited. That's what users told us. Users who recommended 22Slides loved the simplicity and ease of use in getting setup. Users who didn't recommend 22Slides were frustrated by a limited amount of options. Users repeatedly said two things about Photofolio: it has outstanding customer service and that it's on the expensive side of things. The most common complaint with Dunked is templates: there aren't enough templates to choose from and templates lack customization options. Otherwise users find it easy to use and simple. Users mentioned that Zenfolio is not the easiest to use ("I am not a very tech-savvy person, and I feel you need to be with Zenfolio", "it's not always the most intuitive")— which may be due in part to it's age: users also suggested it can feel outdated. Users suggested Fotomerchant is good for weddding photo photographers— in part because they offer direct fulfillment and self fulfillment— though reviews were mixed. SmugMug does more than just a website— it includes storage, presentation and website. Users frequently mentioned that it's easy to use. Adobe My Portfolio comes free with Creative Cloud and most users seemed to have choosen it because of that: "I chose [it because] it was available with my subscription", "a no-brainer if you’re a user of other Adobe applications" . Many users suggested Krop is easy to use ("I have very little experience building websites myself, yet everything Krop has is comprehensive and easy")— though a few people mentioned it's not very good at dealing with video— so videographers beware. Users complained that layouts were plain and lacked selection or customization. Users also suggested it's not great for video— and it requires an upgrade. Limited in customization options and features— that's what we heard from users. Themes are also not responsive— which is not great for a photography website builder in 2019. Wix and Squarespace are what I call general website builders. Which means they can build a variety of websites— not just photography websites. 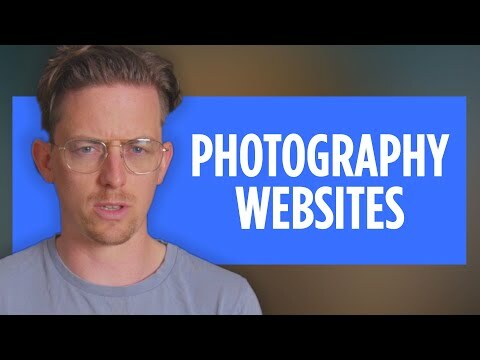 Photography website builders like Format and SmugMug are not general website builders— they’re meant specifically for creating photography websites. General website builders are designed for all kinds of websites— including photography. So why might you want a website builder designed specifically for photography websites? Many photographers also use their website for proofing. Proofing, if you’re unfamiliar, means creating private photo albums for clients to view or download the images. Many photography website builders include proofing features. Wordpress isn’t a website builder. It’s a content management system (CMS). Website builders and CMSs both build website but they have differences. For example a website builder hosts your website for you— so you never have to worry about hosting. CMS’s like Wordpress require you to setup a web host— which can be tricky. Now the upside to using a CMS like Wordpress is that you can move Wordpress websites between hosts— whereas your website on a website builder always has to be hosted by that website builder. This guide was created by contacting verified users of photography website builders and asking their opinion of the photography website builder they use. Reviews were not incentivized in any way. Customer satisfaction is the percentage of users that that recommended the photography website builder. I talk to a minimum of 30 users / company in order to calculate the customer satisfaction.